Discover the mystique of New Orleans at 'Chartres Street Cottage', a 2-bedroom, 1-bath vacation rental cottage that sleeps 4. Built in 1892, this historically landmarked property showcases quintessential Louisiana architecture and includes all the modern comforts of home. Retreat to the shaded porch each night, where cicadas lull you into a New Orleans state of mind. 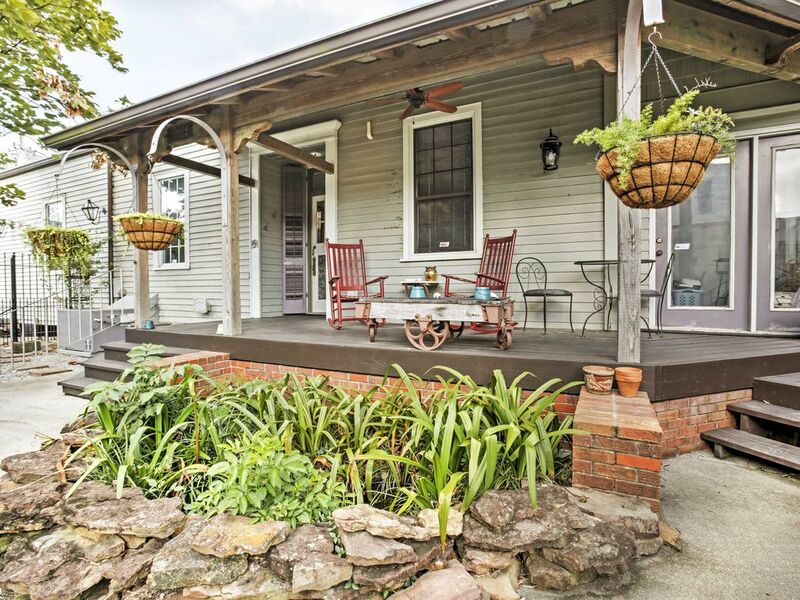 This charming property is tucked behind the colorful walls that fill the Bywater Neighborhood. Boasting nearly 1,300 square feet of living space, this cottage features a spacious and inviting atmosphere that will envelop you with the essence of New Orleans. Lie back in the living room, where you can enjoy a book beside the natural light pouring in through the windows, or bring down the shades and tune into a show on the cable TV. While guests enjoy some downtime, head into the kitchen to begin preparations for a home-cooked meal. This space is fully equipped with updated stainless steel appliances and ample amenities so cooking a Creole meal can be done with ease. Gather around the 4-person dining table to eat, or head out to the courtyard for a picnic! Enjoy good food and great company around the patio dining table with the courtyard garden as your backdrop. The courtyard is complete with rocking shares, a shaded porch, and a fire pit. If you're traveling with a large group, be sure to check out the availability of 'The Creole Cottage'. This 2-bedroom, 1-bathroom cottage sleeps 4 and is located on the same property as the 'Chartres Street Cottage.' Rent the 2 properties at once to spend your vacation with all of your loved ones, while still maintaining all of your privacy. The 'Chartres Street Cottage' is ideally located in one of the oldest sections of New Orleans bustling with local life. If you're a foodie fanatic, start the day walking 2 blocks over to Satsuma for a farm-fresh breakfast before taking the river walk down the Mississippi. From there, venture to Bar Redux to taste some 5-star Creole cooking - less than a 20 minute walk away. Finish the night with a drink at Markey's Bar, just around the corner, and be sure to ask for Roy! Visit famous New Orleans hot spots with a short drive down to the French Quarter, just 1.5 miles away. As the oldest section of the city, this neighborhood is filled with history, charm, and plenty of local shops, restaurants, events, and nightlife for everyone to enjoy! From here you can also visit the main street of New Orleans, Canal Street, just blocks from the French Quarter. Venture outside of the city and onto a boat for a river cruise or swamp tour! Drive 8 minutes over to New Orleans Steamboat Company for a spot on a traditional steamboat, or 5 minutes over to Cajun Encounters Tour Company to take a boat ride down the Honey Island Swamp. New Orleans is brimming with culture and adventure, with an activity for every kind of traveler! Walk around City Park, visit the world-famous Audubon Zoo, learn about your favorite sea creatures at the Aquarium of the Americas, or get spooked at one of the cities ghost or voodoo tours. - Amenities include a fully equipped kitchen, free WiFi, cable TV, central air conditioning, in-unit laundry machines, fenced courtyard with patio, fire pit, charcoal grill, covered front porch, and much more! - Colorful, historic area in the Bywater District, just minutes from the New Orleans Art District, French Quarter, and many more local favorites! Registered with the Historic Landmark Commission! Words can not express how much my family and I loved this cute house. The best ever. We were able to walk to several astounding restaurants within a block or two. Also, with the easy 1.5 mile walk to the French Market and Quarter, we left our vehicle parked for the entire week. The area felt very safe which was a major plus for me since we were walking everywhere with two young teenagers. I will never stay in a hotel again when I travel to New Orleans. This house provided plenty of room for us to stretch out and relax after a long day exploring, without invading each other’s space like a hotel can do for a family of four. I would definitely stay in this cute Bywater cottage again. I’ll probably schedule our next New Orleans vaca based on the vacancy of this cottage. Oh.....and Jim is the best! He was very informative and told us of the many nearby places to eat. It was great to know that he was just a text away if we needed anything. Amazing experience 😁�👍�. This property was in a great location, clean and since it’s gated it felt super safe! I loved how our vehicle was behind a locked gate and not on the street. Mr Jim was incredibly kind and knowledgeable about the area. He made us feel at home and really helped whenever we needed. Loved the porch with rocking chairs, very relaxed and comfy! If you want delivery definitely get “pizza delicious”, the crust is the best I have ever eaten!! Also try “Elizabeth’s” right next to property, the fried green tomatoes are perfectly on point! Would not recommend satsumas.... terrible service and very unfriendly there. All in all will be back here, it was PERFECT!! Thank you mr Jim for making it wonderful for us! Loved staying here. Enjoyed morning coffee on the porch every day. Perfect location, a short walk from frenchmen street. We truly enjoyed living here. Jim and Doug were helpful and very quick to respond. We recently stayed at this property (Jan 2019) and thought that it was great. I was contacted by the property manager (Jim) a couple days prior to the arrival, about our arrival time. I thought this to be a very professional approach, as some of the other properties that My husband and I have stayed at required us to reaching out to the owners. We met Jim upon our arrival, a very nice gentleman. He gave us the in/out of the cottage and neighborhood, letting us know where to grab a late bit or a friendly drink with some good music beyond the French Quarters. Overall, the property was sufficiently equipped, and neatly maintained. It is close enough to walk to the French Quarters, yet peaceful enough to get some shuteye without being disturbed by the late night crowd. A pleasurable experience.